Nebulas Rank (NR) is an open source ranking algorithm used to measure the influence of relationships among addresses, smart contracts, and distributed applications (DApps). It helps users utilize information within the ever-increasing amount of data on all blockchains, but it also helps developers to use our search framework directly in their own applications. Finance is essentially the social activities which optimize social resources via capital liquidity and in turn promotes economic development. 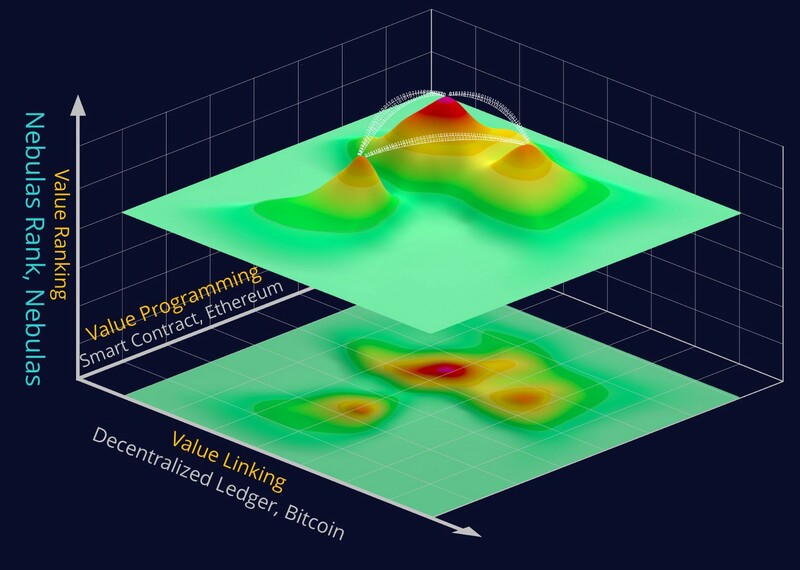 Blockchains establish a value network in which the financial assets can flow. Daily volume of Bitcoin and Ethereum, which are most familiar to us, already exceeds $1 billion. From this data, we can see that the higher the transaction volume and transaction scale, the higher the liquidity. As a consequence of this, higher liquidity will increase the quantity of transactions and enhance the value. That will further strengthen the value of the financial assets, creating a complete positive feedback mechanism. Therefore liquidity, i.e. transaction frequency and scale, is the first dimension that NR measures. Social platforms like WeChat and Facebook have almost 3 billion active users per month. Social platforms’ rapid user growth is a result of the reflection of existing social networks and stronger viral growth. In particular, viral transmission, i.e. speed, scope, depth of information transmission and linkage, is the key index to monitor the quality of social networks and user growth. In the blockchain world, we can see the same pattern. Powerful viral propagation indicates scope and depth of asset liquidity, which can promote its asset quality and asset scale. Thus, viral transmission, i.e. scope and depth of asset liquidity, is the second dimension that NR measures. During the early stages of the internet, there were only basic websites and private information. Now, information on different platforms can be forwarded on the network, and isolated data silos are gradually being broken. This trend is the process of identifying higher dimensional information. From our point of view, the world of blockchains shall follow a similar pattern, but its speed will be higher. The information on users’ assets, smart contracts, and DApps will become richer, and the interaction of higher dimensional information shall be more frequent, thus better interoperability shall become more and more important. Therefore, the third dimension measured by the NR is interoperability. Based on the aforementioned dimensions, we started constructing Nebulas’ NR system by drawing from richer data, building a better model, digging up more diversified value dimensions, and establishing a measure of value in the blockchain world.